Until today, since we bought the house, and probably for the last couple decades, the washer and dryer have been positioned several feet apart. In between was either a wide gap, or an old table, making the transfer of clothes from the washer to the dryer difficult and frustrating. Furthermore, as a tall man myself, and with my wife also slightly above average height, it was a figurative and literal pain to bend down and stuff the clothes in the dryer. I solved both problems by building a ten-inch pedestal. 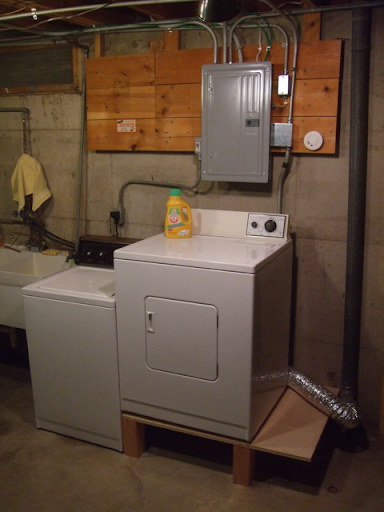 Built from a piece of nice clean scrap plywood for the top, and some scrap four-by-four wood for the legs, the pedestal raises the dryer to a more reasonable height. The plywood was deeper and wider than needed to support the dryer, which turned out to be very nice, as the extra depth in the back is the right size to support the dryer output tube (visible in the picture coming from behind the dryer), and the extra width serves as a nice little shelf on which to put things like a trash can or extra bottles of detergent. Also shown in the picture is the smoke detector I added in that space, because my mother filled me with the irrational fear that clothes dryers can explode in a ball of fire at any moment.